Item # 159898 Stash Points: 6,999 (?) This is the number of points you get in The Zumiez Stash for purchasing this item. Stash points are redeemable for exclusive rewards only available to Zumiez Stash members. To redeem your points check out the rewards catalog on thestash.zumiez.com. 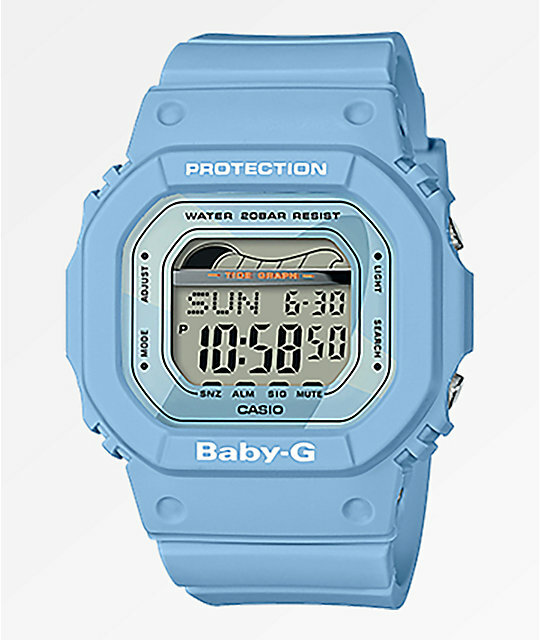 An ideal surf companion, the BLX100 Baby-G light blue digital watch from Casio offers a water-resistant design and includes a tide graph. This durable watch was made to keep up with your active lifestyle and offers and adjustable band for a perfect fit. BLX100 Baby-G Light Blue Digital Watch from Casio. 200M /20 ATM water resistance.